Disclaimer: This post can be for both boys and girls, but I didn’t want to keep saying “him or her” or “boys or girls,” etc. so I decided to put boys in the hot seat. I’m not sorry. Also, beauty is just one of the many issues that one can observe in the dating scene. However, my blog deals with appearance so that’s what the majority of my posts focus on. Is this really from Marilyn Monroe? I feel like half the quotes on the internet are attributed to her. Either way, I like this quote because it calls out people’s superficial dating strategies. You can see this everywhere, even in the Christian world. A boy starts looking for a girlfriend. He sees a plain-looking girl and is kind to her, but never bothers to pursue her past the friend stage (a.k.a. he looks at the plain cover and decides to just skim the book or not read it at all). Then he sees a beautiful girl complete with a beautiful face and a perfect body. And, despite only seeing her appearance, he thinks, “I should get to know her better, she could be the one.” And he pursues her way past the small chat stage (a.k.a. he notices the beautiful cover and decides to study that book cover to cover). I call these people the “fake inner beauty seekers.” Think of a Venn Diagram. You have all the beautiful girls represented by one circle, and all the wise/kind-hearted/humble girls represented by another circle. The place where they overlap in the middle – that’s the girls most men go for. Yes, I actually made a Venn diagram. This is a serious issue people. So most Christian guys go for that middle section. Can you blame them? I guess not really. Like I keep saying – we were made to appreciate beautiful things. However, I find one main issue. 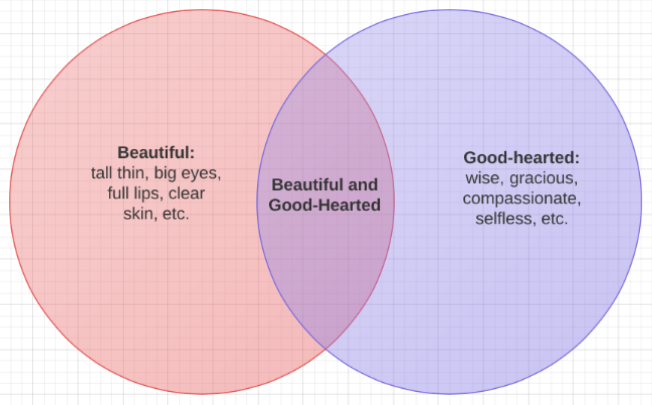 If my very scientific Venn diagram is correct, this means that 75% of the girls in the “Good-hearted” circle are just as good-hearted as the girls in the middle oval, but they’re dating life is a barren wasteland. It’s because all of the men are fishing in that middle oval complaining about how hard it is to find a good catch. Then one boy wises up, says forget this, and throws his line into the wide open pond behind all of his frustrated comrades and BAM. Literally a pool of kind-hearted, wise, sincere, average-looking to below-average looking women. He’s like, “Wait, is this a set up? Where are all the other fishers?” And then an older, wiser guy who’s already married comes up to him and is like, “Nah, it’s real, but you have to let all the other men figure it out for themselves” and walks away incandescently happy with his faithful wife. Let’s look at some examples of guys fishing in each of the three categories. This is pretty much every movie ever made. The guy sees a beautiful girl and immediately decides to pursue her. In the movies, this always ends up surprisingly well. They just happen to be soul mates. Mhmm sure. As for a Biblical example, I would definitely say Jacob. He is out to look for a wife when he spots Rachel who has “a beautiful figure and a lovely face” (Gen. 29:17), and he decides right then and there that he wants to marry her. Richard Strauss of Bible.org says, “Jacob was impressed—probably too impressed. We get the idea that he was so fascinated by Rachel’s beauty, and so enchanted by her charm, that he failed to recognize her shortcomings or even to consider the will of God in his relationship with her. . . I think Mr. Bingley is a good example of a middle oval fisherman. 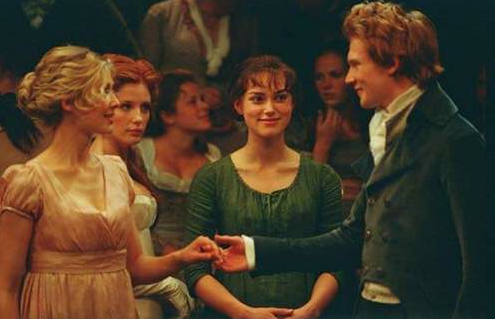 When he first meets Jane he thinks that she is beautiful, and he decides that he wants to get to know her better. 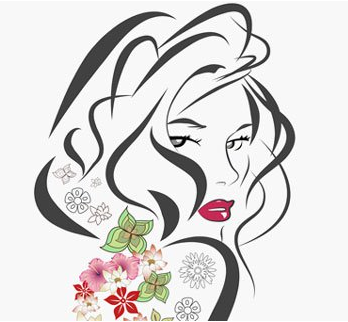 So her looks are what first caught his eye – not her personality or character. However, he had the decency to get to know her first and, sure enough, they fall madly in love with each other and are happily married. So, as you can see, I am in no way saying the middle oval is a bad pond. No, it’s a great pond. I’m just saying that it’s no better than the pond to the right. “The woman was intelligent and beautiful” (1 Sam. 25:3). Straight to the point. The Talmud actually lists her as one of the “four women of surpassing beauty in the world” so yeah, I’d say David was fishing in that middle pond area. 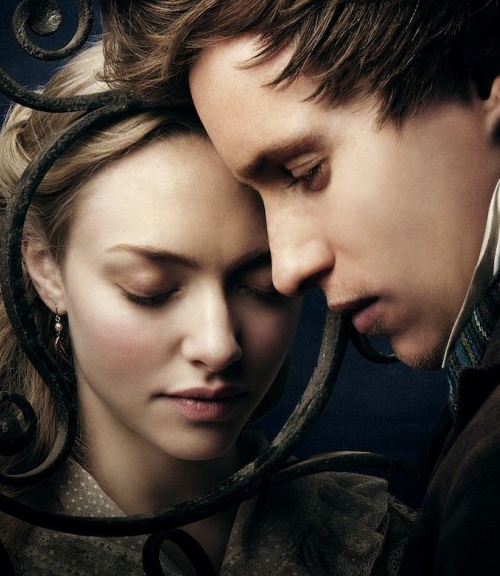 But, like Mr. Bingley and Jane, the story ends well. She was a great catch, as all the ones in the middle are. Again, just don’t show the middle oval favoritism over the rest of the right circle. Mr. Rochester of Jane Eyre comes to mind as a right circle fisherman. 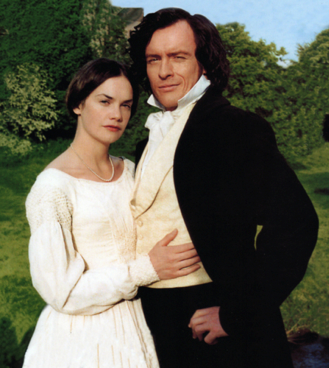 Jane is very plain-looking but, over time, Mr. Rochester falls deeply in love with Jane for her heart and mind. He enjoys their intellectually stimulating conversations, and he treats her as an equal. Sigh. I really love this story. Look how proud they are of each other! Okay, now for our Bible example. Oh wait, there isn’t one. At least not that I could find. The only unattractive married person that I could find in the Bible was Leah. 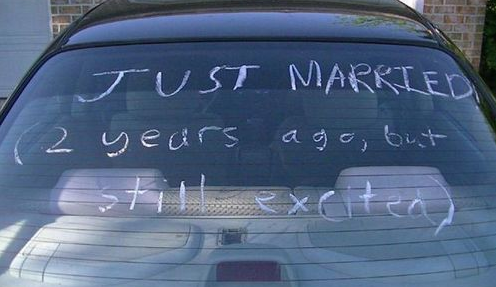 And Jacob got tricked into marrying her so I don’t think that really counts. But want to know who wasn’t blindsided by beauty? God. He saw that Leah was being treated poorly because she wasn’t as pretty as Rachel, and He gave her children. He was so ordinary looking that none of the disciples mention anything about his outer appearance. Judas Iscariot – who betrayed Jesus – even had to identify him with a kiss. God is well aware of people’s tendencies to be biased toward beauty, but God is never tempted to do this. Jesus could have come down as a youthful man beautiful in face and form, but he didn’t. Because outer looks mean nothing to God. They don’t affect His perception of us. And they shouldn’t affect our perception of each other. God is the wisest of all beings, and He only looks at the heart. So shouldn’t we only look at the heart too? Let’s do a test. How are you approaching the dating scene? I’ll give you two examples that you can compare yourself to (pretty sure I made this whole post just so I could play with the Venn Diagram program). 1. 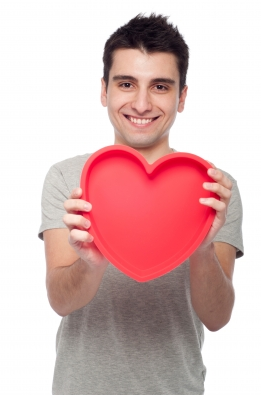 Mentally divides Girls/Guys between beautiful-looking and comely-looking. 2. Looks at the “beautiful” crowd and divides it up between the mean-hearted and the good-hearted. 4. Finally, picks from the pool of beautiful, good-hearted girls/guys that she/he clicks with. 1. 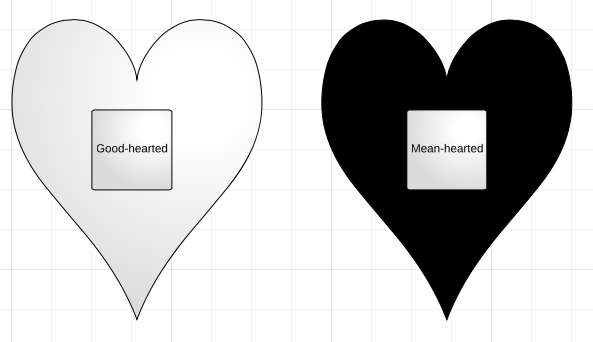 Divides the girls/boys between the good-hearted and the mean-hearted. 2. Picks the good-hearted group and divides it between the girls/boys you click with and the girls/boys you don’t click with. 3. Voila! Date in the pool of good-hearted girls/boys that you click with.
. . . And then fall in love with someone for who he or she is, and I promise that he or she will become the most beautiful person that you have ever and will ever meet. Now that’s LOVE with a capital L-O-V-E.
And for any boys, I know you like things short and simple so here it is: don’t go for the girl who catches your eye, go for the girl who catches your heart. Thank you Jamison, ace that test!